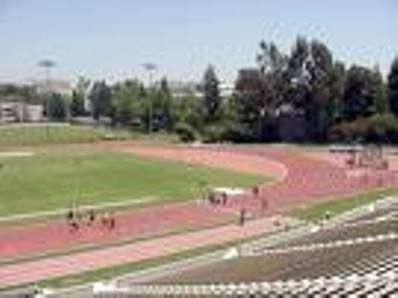 Drake stadium is usually open to the public, except when there is a UCLA soccer game, track meet, or practice. Drake has many unique qualities that appeal to the fitness crowd. You can workout on the stadium stairs (you will see people doing crazy things like hopping up three sets of stairs at a time!! ), on the track (4 times around is a standard mile), practice your long jump, use the rings and pull-up bars…your options are endless! Drake provides a very lively atmosphere, even at 6:00am! This exercise locale is like a blank palette; you can simply walk around the track and chat with friends, or bring a mat and weights for your very own mini boot camp. The stairs are mostly concrete and can fit at least two people across. Their large, flat surfaces make Drake stadium easy enough for beginners who are just getting used to the challenges of stair-stepping, but are also great for veterans who want to push themselves harder each time. You can also park in the residential/dorm area just adjacent to the stadium, but read the restricted parking signs VERY carefully! Drake is a great place to go with friends since there is something for everyone! We would definitely encourage you to go while it is light out, as you need to walk through a portion of the UCLA campus, and it can get very dark. Parking can be a bit of a pain, but as long as you are prepared with your quarters, you’ll find the workout well worth it once you’ve fed the meter. Our typical routine consists of running the stairs (the amount of ups and downs varies) and then cooling down by jogging a few laps around the track. Each time we go, we try and add on one more set of stairs. On some days though, we’ll lug our yoga mats and weights down to the main field and try to incorporate some quick lifting and abs in between sets. Sometimes we’ll carry a small set of hand weights as we speed walk around the track to add an extra workout bonus. If you do go alone, we recommend bringing your iPod (the music will definitely help!) and don’t forget to keep your eyes peeled for some of the “other” excitement Drake has to offer: just the other day we were able to watch pole vaulting practice, and, since Drake is rumored to be a favorite workout spot for Ryan Phillippe, Justin Timberlake and Jessica Biel, we’re constantly on the lookout. Take note: there isn’t a lot of shade, so don’t forger to bring your SPF! !